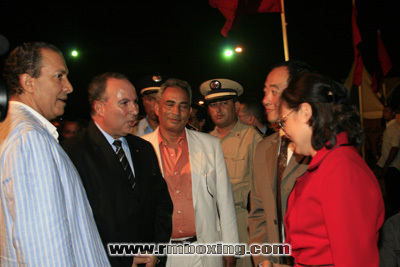 A l’occasion de l’anniversaire du Roi du Maroc, la ville de Mohamedia a accueilli le gala de Muay Thaï organisé par Marocco World et RMBOXING, sur la plage des Sablettes à Mohamedia. Tout s’est déroulé à merveille, le plateau était représenté par la Thaïlande, la France, l’Algerie, la Turquie et le Maroc. Sophie Péan a eu la lourde tâche de démarrer le gala, elle n’a pas démérité face à la marocaine en utilisant son point fort, en outre, ses poings. Elle s’incline la tête haute. Ekapol a livré un combat d’homme, en utilisant comme à son habitude son fameux punch, en face d’un Bensimed virevoltant et actif tout au long du match, une décision très litigieuse en faveur de Bensimed. Delaroche Florence est tombée sur une Adisa Meriem survoltée par son public et par sa boxe électrique, Florence n’a pas su cerné son adversaire et s’incline sans avoir démérité. Sofian Seboussi face au champion du Maroc et de Hollande Abder Bchiri, a tout de suite compris qu’il fallait imposer un rythme effréné en utilisant tout le panel du Muay Thaï en corps à corps pour remporter une victoire haut la main, en s’imposant ainsi Sofian devient l’une des pointure de sa catégorie avec ses 5 Victoires consécutives en 4 mois. Sudsakorn face à Salahdine Ait Naceur, un combat très propre où les deux combattants malgré leur appartenance au RMB ne se sont fait aucun cadeaux. 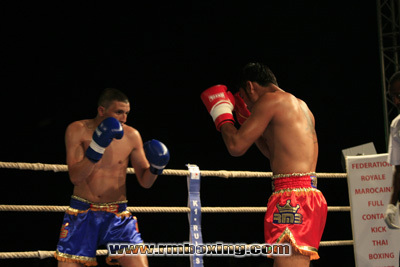 Chacun utilisant à merveille leur point fort, low et middle kicks pour Sudsakorn et boxe anglaise pour Salahdine. Décision partagée, deux juges à un pour Sudsakorn. 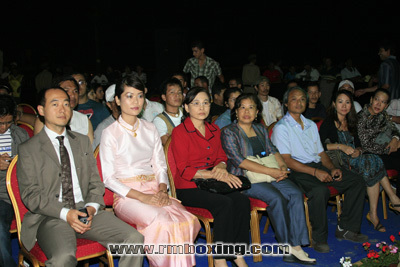 Somrak Khamsing, la super star thaïlandaise a été opposé à Nicolas Germain très courageux, comme à son habitude Somrak a ravi tout le public par sa boxe imprévisible et expérimentée et remporté le match. Jao Chalam le thaïlandais à en devenir est venu à bout de Camel Metzani pourtant invaincu depuis quelque années. Djemil Semad est tombé sur un roc en l’occurrence Badr Halaoui qui a boxé avec ses tripes pour son drapeau. Victoires logique de Badr. Le gala sera diffusé sur Canal + sport le jeudi 27 Aout 2009 et sera en rediffusion par la suite. Un documentaire est prévu sur France 2 et France 3 pour fin Aout début Septembre. Nous tenons à remercier toutes les personnes qui nous ont aidé et fait confiance pour que cet évènement soit une réussite totale. Rémi, Nico, Dom etc… et toutes les teams présentes. 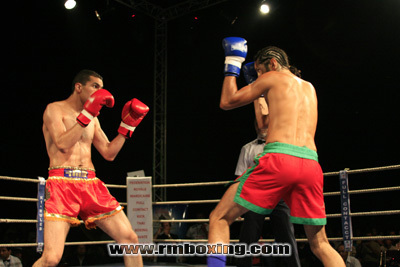 بمناسبة العيد (يوم ميلاد) ملك المغرب في مدينة mohamedia رحب مسؤول استقبال muay Thai أو مقام rmboxing العالم الأخيرة, على الشاطئ من sablettes mohamedia على شيء فهو merveiller على عدم حل من (هضبة) فكانت من نصيب في تايلاند وفرنسا المتعلقة وتركيا والمغرب. 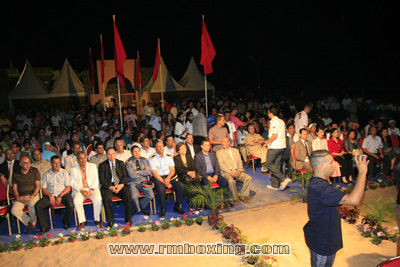 For the birthday of King of Morocco, the city of Mohamedia received the gala of Muay Thaï organized by Marocco World and RMBOXING, on the beach of Sablettes at Mohamedia. 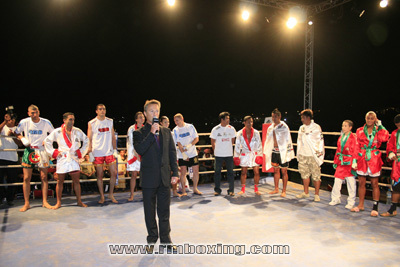 Everything took place very well, pthe fight card was represented by Thailand, France, Algerie, Turkey and Morocco. Sophie Péan in had the heavy task to start the gala, she was not unworthy facing the Moroccan by using her key point, besides, her fists. She lost but without shame. Ekapol had a fight of man, by using as usual his famous punch, facing a twirling and active Bensimed throughout the match, a very litigious decision in favour of Bensimed. Delaroche Florence was against Adisa Meriem overexcited by her public and by her electric boxing, Florence did not reach to take advantage on her opponent and lost without being unworthy. 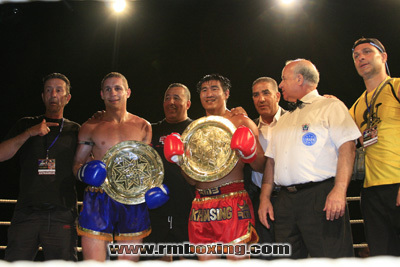 Sofian Seboussi against the champion of Morocco and of Holland Abder Bchiri, understood that it was necessary to impose a wild rhythm by using all the clinch technics of Muay Thaï to have the victory easily, so by winning like that Sofian became one of the thoughest fighter of his category with his 5 consecutive victories in 4 months. 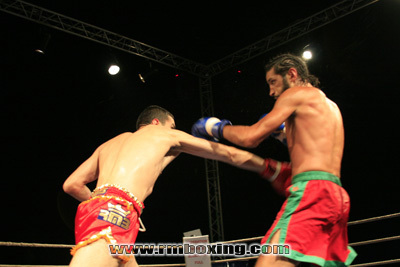 Sudsakorn against Salahdine Ait Naceur, a very clean fight where both fighters in spite of their membership in the RMB made nobody presents. 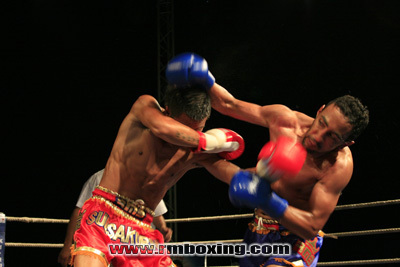 Each using marvelously their key point, low and middle kicks for Sudsakorn and boxing for Salahdine. 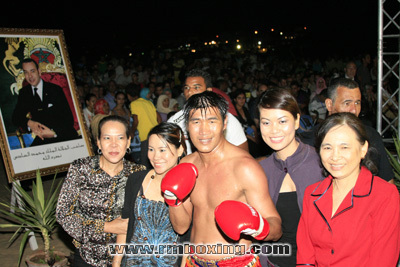 A shared decision with two judges to one for Sudsakorn. 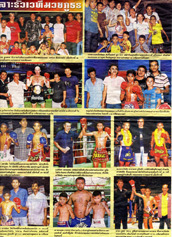 Somrak Khamsing the great Thai star was opposed to a very brave Nicolas Germain, as usual Somrak has enchanted all the public by his unpredictable and experimented boxing, and won the fight. 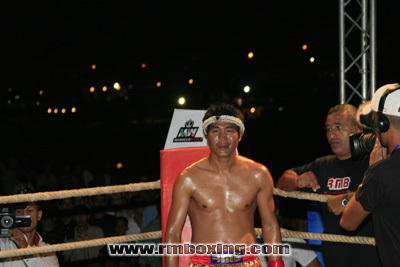 Jao Chalam the rising Thai star won against Camel Metzani yet unconquered for years. Djemil Semad fell on a rock, in this particular case on Badr Halaoui who boxed with his guts for his country. Logical victoiry for Badr. The gala will be broadcast on Canal+ Sport on Thursday 27th August 2009 and will be broadcast afterward. A documentary (planned on France 2 and France 3 for the end of August beginning of September. Zimerbeach (Angel, Hassen, Rachid, Dalia, Ouafa, all the staff of the zimerbeach) Rémi, Nico, Dom etc. and all the teams. Anläßlich Des Geburtstages des Königs von Marokko Die Stadt von Mohamedia in empfangen world das Fest von Muay Thaï Organiser Par Marocco und RMBOXING am Strand des sablettes Mohamedia alles ist das zu merveiller abzurollen, das Tafelland(Tablett) war vom Thailand, Frankreich, Algerie, turquie und Marokko dargestellt(vertreten). Op het ter gelegenheid van de verjaardag van koning van Marokko de stad van mohamedia in staat positief tegenover de officiële inontvangstneming van muay thaï organisator by marocco wereld en rmboxing, op het strand van sablettes tot mohamedia alles wat het is te komen tot merveiller de bak was vertegenwoordigd door de Thailand, Frankrijk, algerie, Turkije en Marokko. 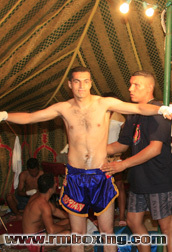 In occasione di Il compleanno del Re del Marocco La città di Mohamedia ad accolto la gala di Muay Thai Organizzare Per Marocco world e RMBOXING, Sulla spiaggia dei sablettes a Mohamedia tutto questo è svolgere a merveiller il vassoio era rappresentato dalla Tailandia, La Francia, L’Algeria, Il turquie ed il Marocco.